Fayette County, in south-central West Virginia (WV), was created in 1831 from parts of Logan, Greenbrier, Kanawha, and Nicholas counties. It was named in honor of the Marquis de LaFayette. Its county seat is at Fayetteville, though its largest municipality is Oak Hill. The New River and Kanawha River carve steep-walled valleys across the county, dividing it into eastern and western regions. The Gauley River and Meadow River carve similar valleys in their courses along the northern boundary of the county. Traversed by the New River Gorge Bridge, the New River Gorge is among the best known of these valley regions. Tourism is the chief employer in Fayette County. Each year more than a million tourists visit the region, attracted largely by the gorge and recreation opportunities, including hiking, biking, fishing, hunting, camping, kayaking, rock climbing, and whitewater rafting. The home of the National Boy Scout Jamboree, the Bechtel National Scouting Center at Mount Hope attracts thousands of scouts to the region annually. As of the 2010 census, the population of Fayette County was 46,039. 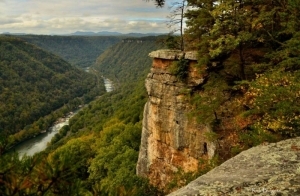 Further information on lodging, dining, and recreation in Fayette County may be found in our guide to travel in the New River Gorge Region in southern West Virginia, in which Fayette County is located.